Low voltage lighting systems are easy to install and provide an affordable way to light various areas of your home and yard. While many people are just now catching on to the economical aspects and convenience of low voltage lighting, these systems have been around since the 1950s. The design was introduced by an electrical contractor, Bill Locklin, when a client turned to him for help with some outdoor lighting. As an alternative to the typical 120 volt lights commonly used during this time period, Locklin used headlamps, containers, and car batteries to create 12 volt lighting fixtures, and the popularity of these low voltages alternatives began to grow. Installation is a breeze. Even the electrically-challenged can install low voltage lighting without the aid and expense of an electrician. Systems can be purchased as kits complete with a plug-in transformer, light fixtures, and cable wire. Systems are energy efficient.Low voltage implies less energy consumption, and that certainly is an important reason for choosing this type of lighting. Most consumers prefer the 12 volt option. Low voltage means safer installation. If you take certain precautions, you can install other lighting when the power is on if using low voltage. Low voltage fixtures are safe to use outdoors even during the rain. Timers offer another convenience.Choose from kits which allow you to set time durations, or look for systems that feature photocells for automatic off and on controls. You can use low voltage lighting systems in a variety of areas around your home, such as bathrooms, kitchens, living rooms, home offices, and in landscaping areas, such as sidewalks, driveways, patios, porches, decks, curbs, and gardens. Restaurants and museums often use halogen low voltage lighting as well. When installing low voltage light fixtures outside, plug the transformer into an outdoor 120 volt power outlet that features a ground fault interruption circuit (GFCI). The cable wire should be fixed to the transformer, and this wire provides power to the fixtures that are connected. The transformer should match the combined wattage of the lights. Adding more lights-If you need to add more lights, you may need to upgrade the transformer or add a second transformer. Just be sure to keep the total wattage even with or below the transformer's maxim output rating. You can actually mix bulb wattage as long as you stay within the output rating minimums. Bulb wattages typically run from four watts to 50 watts. It is important to remember that the quality of cable wire used can directly affect the brightness of the lamps. You should also note that voltage strength can decrease over longer distances. Safety issues-Many people believe they must bury a low voltage cable, but these cables are generally weatherproof. You may want to bury it for aesthetic reasons however. You should not connect a transformer to an electrical outlet using an extension cord, however. Use only a transformer with a covered outdoor GFCI outlet. Finally, if you are planning on using low voltage lights in your landscaping, it helps to create a plan ahead of time regarding where you want to install your lights. Home improvement stores such as Home Depot and Lowes can offer suggestions as well. 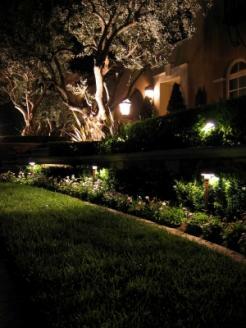 A lighting plan can help you feature certain areas of your yard that you want accented, and it can also draw attention away from areas that you don't want featured.